So the first thing we did (after goofing around with it for a bit) was make it into a little beginning sounds game. I grabbed some address label stickers and a sharpie, and my little guy told me some words to write. I started off by saying, "Tell me a word that starts with the letter ___" and he would say it, and then I would write it. Simple :) and he was more motivated to read the words that he said than ones that I chose for him. Next I stuck the stickers on the fish. 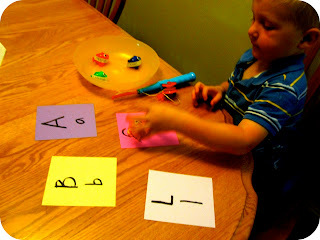 I also quickly wrote each letter on a card and then we got started playing! The little guy fished in our bowl... and once he caught a fish, he lifted it up, "read" the words (if he forgot one, I had him look at the first letter and that usually helped him remember), and then he dropped the fish on top of the corresponding letter card. The nice thing about the stickers is that you can easily pull them off and stick on new words! 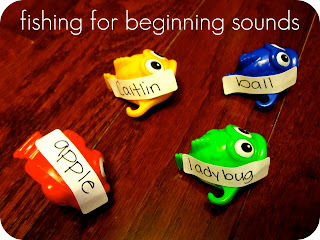 To make this harder, you could have kids matching the medial or ending sounds instead of just the beginning sounds (For example, match the /a/ sound in ball, instead of the b). 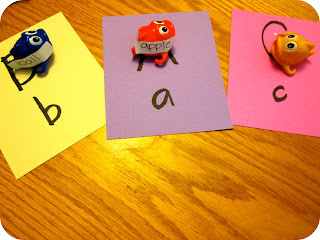 I also love this School of Fish ABC Activity from over at No Time for Flashcards.